This holiday home/group home for up to 37 people is situated in a panoramic location on the Riedberg, approx. 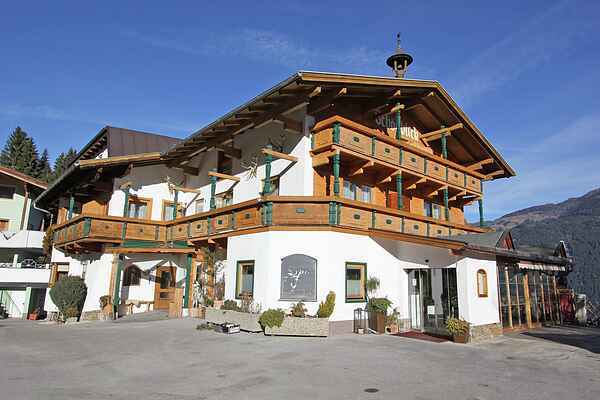 3.5 km above Ried im Zillertal, and has about 500 sqm of living space spread over 3 floors. The basement features two well equipped kitchens, a common room with a large panoramic window with a view of the valley, satellite TV, 3 toilets and a spacious wellness area with a sauna cabin , steam bath, rock shower and 2 relaxation rooms. The use of the wellness area, which is also available to the guests staying in the apartments in the adjacent house, is free of charge. The 1st and 2nd floor have a total of 14 bedrooms with double beds and a sofa bed in some rooms, 3 of which are family rooms with double beds and separate access to rooms with bunk beds. With an occupancy of up to 22 people, the family rooms are unavailable. All rooms have a shower/toilet and satellite TV, WiFi (inclusive), and some have a balcony or share a balcony with another room. The guest area on the ground floor will stay closed. There's a ski room and a ski boot dryer. Beneath the house you'll find a wildlife enclosure with deer. Each morning (once a day), you can take the ski shuttle to the valley station Hochzillertal in Kaltenbach, a 5 km ride, and back in the afternoon. In good snow conditions, it is possible to ski all the way down to the house. The access road to the holiday home is a well cleared mountain road; it is recommended that you bring snow chains and you'll find plenty of parking spaces right by the house.